Do you think your agents would convert more leads if they responded to every inquiry via text message instantly? How many times do you think a lead chose a competitor over you because they contacted the lead first? We all know that using a phone is the quickest way to connecting with leads, but who really has time to call every lead within the first few minutes of receiving it? Enter the Text Message Autoresponder. While your competition might be relying solely on e-mail (which could get lost in the pile of spam) or phone calls (you can’t talk all the time) to reach leads, you can beat them all to the punch now. 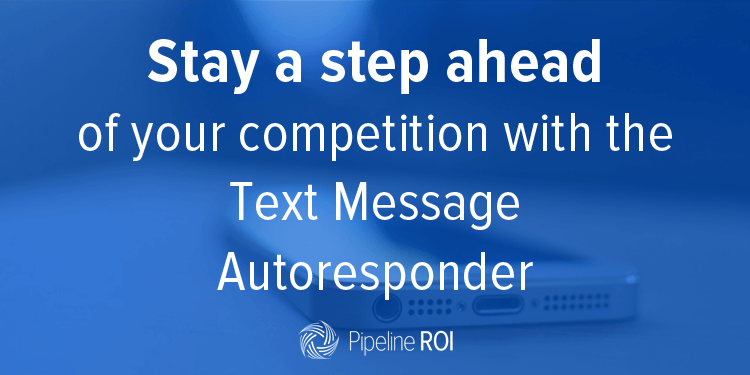 As soon as you receive a new lead from any source, whether it’s Zillow, Trulia, or your website, the Pipeline ROI Lead Manager system will send out a text message on your behalf to connect with the lead. You can rest assured that your leads will hear from your company immediately. The quicker you respond, the less leads you lose to your competition, and the more leads you close. Brokers can even set up the Pipeline ROI Lead Manager system to send a text message once the lead gets assigned to or accepted by an agent. Think of it like an automatic introduction between the lead and the agent who will help them buy or sell a house. Your agents will love that they didn’t have to lift a finger to quickly contact the lead. What are you waiting for? 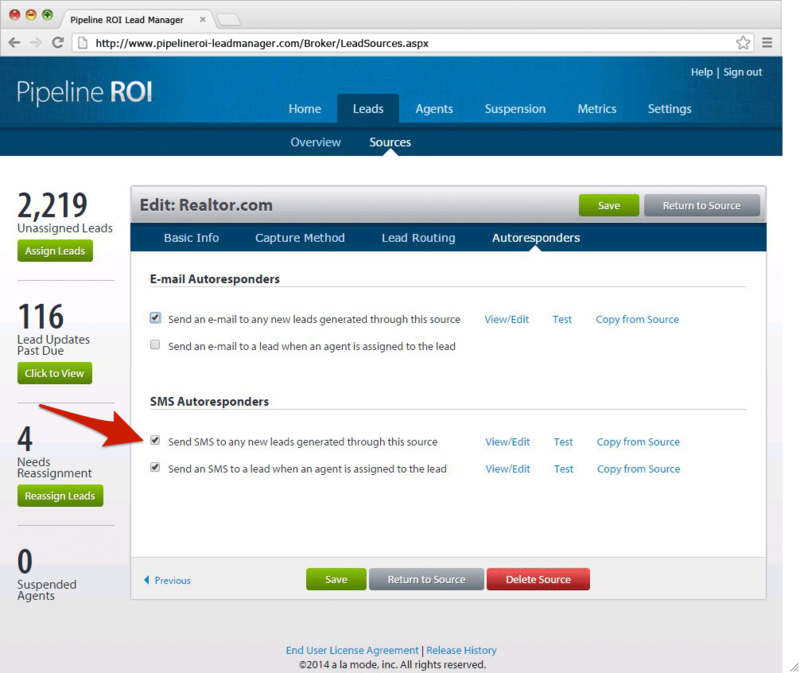 If you’re a broker who is already using Lead Manager, log in now and follow the steps below to turn on Text Message Autoresponders. Log in as the Pipeline ROI Lead Manager admin. Click on Leads at the top of the page. Then, click on Sources just below. 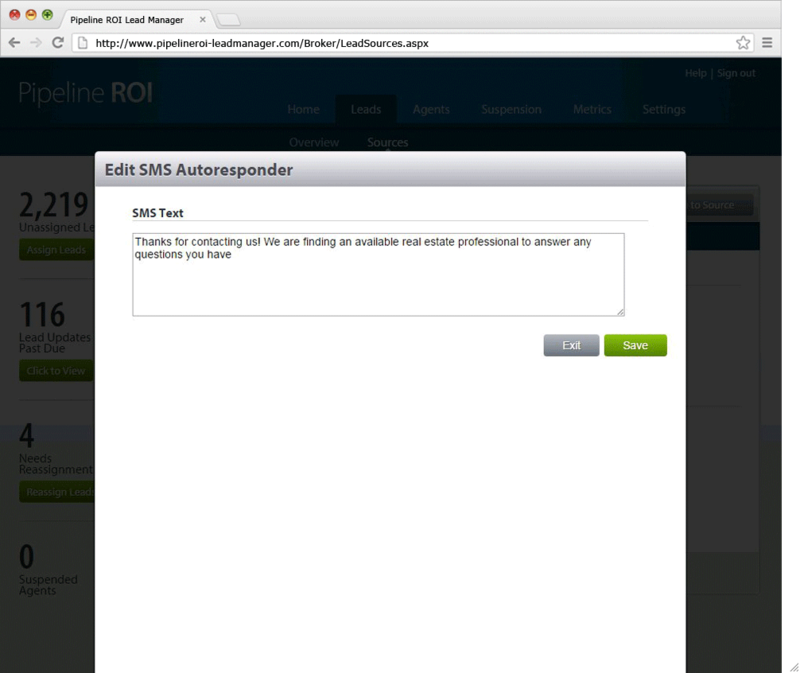 Double-click on the row of the lead source you want to activate SMS autoresponders for. Each source has its own SMS autoresponder controls. This means you can enable it for some sources but disable it for others. With a source profile open, go to step 4 of the setup, Autoresponders. You’ll see options for E-mail Autoresponders and SMS Autoresponders. To active these, just click the check the box next to the Autoresponder you want to turn on. To edit the Autoresponders, make sure you have the checkbox next to one clicked, then click on the View/Edit link to change the message. You can also send yourself a test message or copy the content from another source.